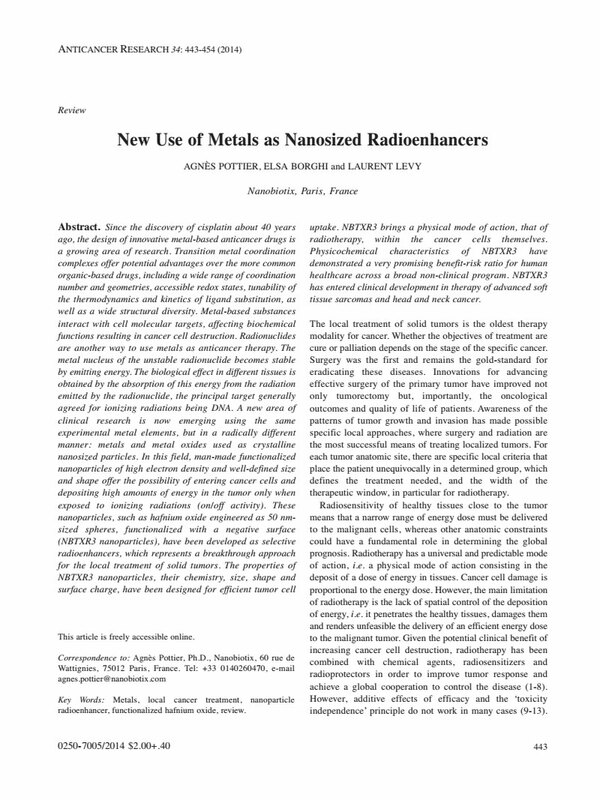 Nano Publications > Publications > Reviews > 2014 – Metals as Nanosized Radioenhancers – Pottier et al. Since the discovery of cisplatin about 40 years ago, the design of innovative metal-based anticancer drugs is a growing area of research. Transition metal coordination complexes offer potential advantages over the more common organic-based drugs, including a wide range of coordination number and geometries, accessible redox states, tunability of the thermodynamics and kinetics of ligand substitution, as well as a wide structural diversity. Metal-based substances interact with cell molecular targets, affecting biochemical functions resulting in cancer cell destruction. Radionuclides are another way to use metals as anticancer therapy. The metal nucleus of the unstable radionuclide becomes stable by emitting energy. The biological effect in different tissues is obtained by the absorption of this energy from the radiation emitted by the radionuclide, the principal target generally agreed for ionizing radiations being DNA. A new area of clinical research is now emerging using the same experimental metal elements, but in a radically different manner: metals and metal oxides used as crystalline nanosized particles. In this field, man-made functionalized nanoparticles of high electron density and well-defined size and shape offer the possibility of entering cancer cells and depositing high amounts of energy in the tumor only when exposed to ionizing radiations (on/off activity). These nanoparticles, such as hafnium oxide engineered as 50 nmsized spheres, functionalized with a negative surface (NBTXR3 nanoparticles), have been developed as selective radioenhancers, which represents a breakthrough approach for the local treatment of solid tumors. The properties of NBTXR3 nanoparticles, their chemistry, size, shape and surface charge, have been designed for efficient tumor cell uptake. NBTXR3 brings a physical mode of action, that of radiotherapy, within the cancer cells themselves. Physicochemical characteristics of NBTXR3 have demonstrated a very promising benefit-risk ratio for human healthcare across a broad non-clinical program. NBTXR3 has entered clinical development in therapy of advanced soft tissue sarcomas and head and neck cancer.